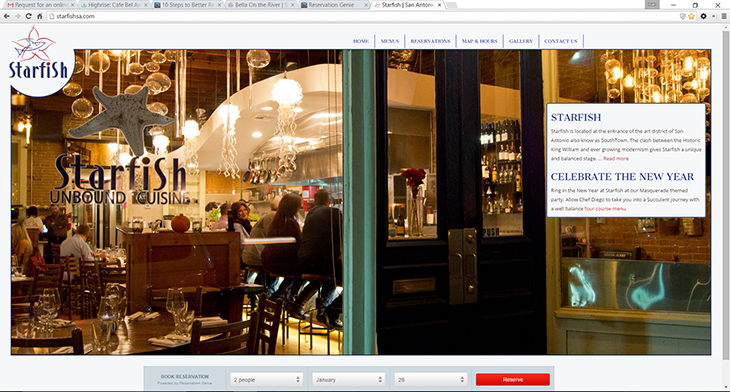 We didn’t mean to get into the restaurant website design business. It started out with just helping a client add a reservations link to their website. Some were concerned they were being overcharged by web designers and couldn’t tell if they were being sold useless bells and whistles. It’s in our interest to make sure our clients have sharp, easy-to-use websites that turn visitors into reservations and then repeat customers. So we eventually decided to offer it to clients for $500 a website. If you’re in the market for a website remodel, this blog will help you get some bearing on what’s involved. 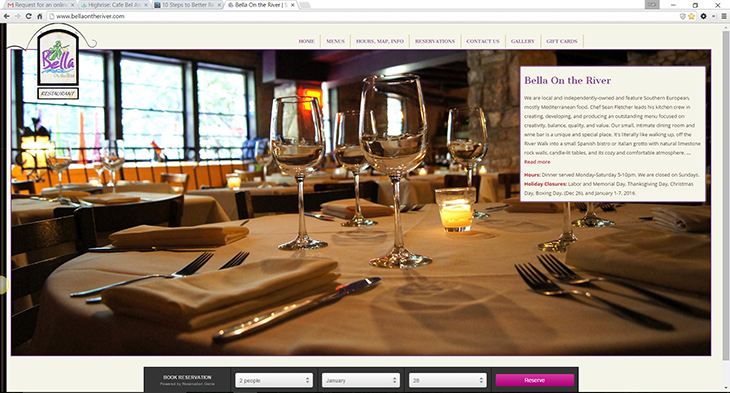 Below are 10 steps to better restaurant website design. The first 5 steps are more about getting started and end user experience. The last 5 steps are tricks to turning your website into a marketing machine. WYSIWYG editors stand for “what you see is what you get.” There are a lot of them out there. Wordpress is probably the best and strongest platform. I’ve been impressed with the ability of Square Space to get so much traction. Wix, 1-and-1, Godaddy’s Website Builder are other examples. A lot of these have come up with solutions to edit your meta tags, import CSS, and even have responsive (mobile friendly) layouts. The end product is not the issue…you can build a great site with them if you have an eye for design. But without a designer’s eye, the end product usually looks amateur. It’s the long term maintenance combined with learning curve that’s the real issue. I see a lot of restaurants that have sites built in one of these platforms and it works for a year or two. Eventually it looks looks outdated and needs an update. The person who spent all the time learning the system is gone or has forgotten how to use it. You end up scrapping those efforts and starting over with a professional designer. We have photographers we use in New York, Austin, San Antonio, and LA that will do do a photo shoot for under $500. Photographers are artists and beauty is in the eye of the beholder. With that being said, you can still get high quality photos from a “starving artist” that will work just fine. It’s about lighting and focus. A point and click camera struggles to optimize both those variables in a stylish way and simply won’t do your restaurant justice. It’s best to pay somebody with a proper camera that can adjust the focus and shutter speed to get good food shots and an artistic touch while capturing your decor. We have photographers we use in New York, Austin, San Antonio, and LA that will do do a photo shoot for under $500. Photographers are artists and beauty is in the eye of the beholder. With that being said, you can still get high quality photos from a “starving artist” that will work just fine. It’s about lighting and focus. People don’t want to read anything over 140 characters these days. I see a lot of restaurants with pages dedicated to the owner, chef, history, etc. This sort of filler space is OK if you don’t have imagery to convey the information. But statistically, we don’t see a lot of time spent on text heavy pages so we know people aren’t reading it. Brief paragraphs that get to the point are appreciated by your viewers. Focus on good pictures and save yourself the effort of writing a thousand words. 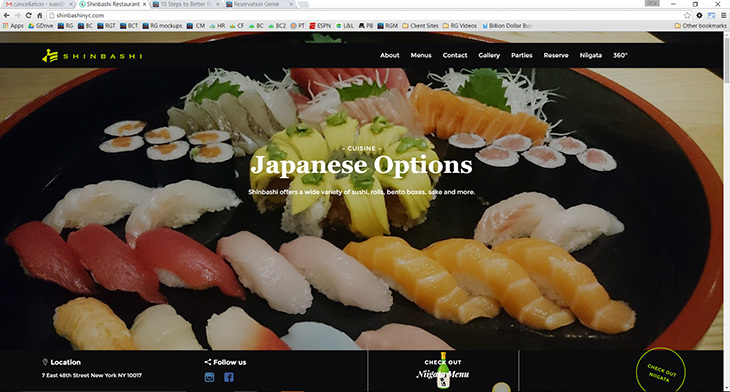 Notice how the homepage screen shot below conveys Japanese restaurant with the image more than text. Step 4: Avoid music, flashy graphics, excessive styling, etc. Every time I open a website with music I spend the first 30 seconds of my attention span hunting down the mute button. At that point, I’m more annoyed than hungry. Adding music is a big no no in web design. Same thing goes for animation. Flash animation used to be hip back in 2000. Apple put an end to it when they refused to show it on Ipads. 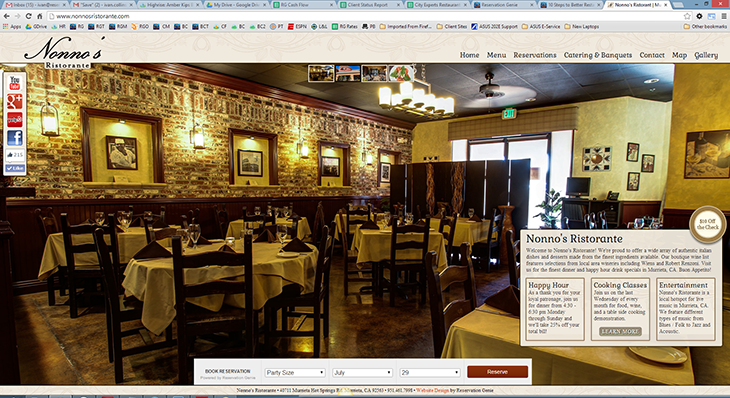 In general, I’d recommend avoiding excessive styling of fonts, menus, navigation, page layouts, etc. It usually leads to poor usability and a general lack of focus. There are lots of ways to offer a mobile optimized website. Reservation Genie offers mobile optimized restaurant websites as a complimentary feature for clients using a “detect and redirect” method that takes just a few minutes to set up. You add a small line of code to your homepage and it will detect mobile phone users and redirect them to a page we built that summarizes your business with gallery, map, about us, hours, contact, etc. You can also design a responsive site that changes shape for smaller resolutions mobile phones use. Make sure you have something in place that caters to mobile users. 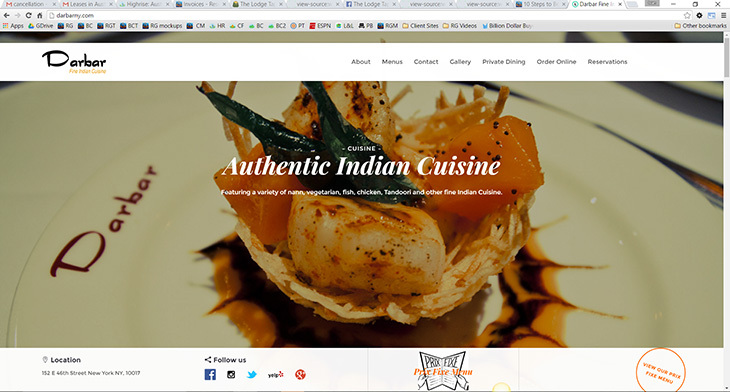 In 2014, we measured stats on 10 different restaurant websites we manage for clients and compiled statistics. About 40% of views were from mobile site and that number is growing each year. If you don’t have website analytics, you can’t measure your performance to determine if there’s room for improvement. Google Analytics is easy to configure and free. It enables you to view statistics about your website. For example, it will tell you how long people are spending on your pages, what search terms they entered to find you, and what websites are linking to you. All of these are important details that can be used to determine what types of online advertising are working for you. The first thing we review when discussing how well your website is working is review your stats. We’ll compare them to other restaurant websites to see if customers are engaged, if you’re well positioned in search engines, and if you have clear areas for improvement. Visit this link to our blog about typical restaurant website statistics to learn more about the value of analytics. The Google 6 Pack is really valuable for Open Table customers who get charged $1 per person for every reservation booked from a 3rd party website. We wrote a blog post titled 5 steps to lower open table invoices that features a discussion of the Google 6 pack. If you’re not familiar with it, it’s about getting high priority pages indexed in Google so that more of your website is featured in search results. This pushes the other content down the search engine results page. When that other content costs you $1 per person booked, it translates directly into savings. You want to make sure your website stands out during Google searches and the Google 6 Pack really helps. It’s getting harder to achieve, but is still a goal to aim for and one of the main negative features from the common 1 page slider websites that have become popular. 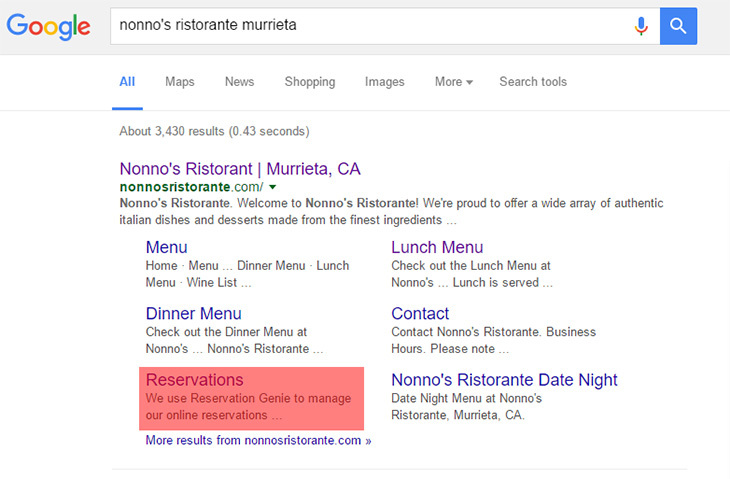 You can see a screen capture of the Google 6 Pack in action below with the Reservations page highlighted in red. If you have more than 6 pages on your website, you might have to use “No Follow tags” to help Google figure out which pages are most important. This is sort of an extension to the step above and was also mentioned in the blog post about lowering open table invoices. Having an actual page dedicated to reservations will lead to it being displayed in the Google 6 Pack and that means less cover fees as people will see an option for reservations in the Google 6 Pack (notice the highlighted reservations page above). It’s still a good idea to add a widget into your main navigation (header, footer, or side bar). Widgets convey more trust more than a regular online form. And just having them on your site encourages reservations. But you still want a reservations page for the Google 6 Pack. Most sites have a contact us form. If not, you need one. You want to make sure you’re collecting those email addresses for email marketing purposes as it’s still one of the highest ROI methods of marketing available. We embed a contact form from Reservation Genie into our clients’ websites. You can see that in action on here. If you embed our form in your site, it will add all the people that submit the contact us form directly into your email marketing list. It also hides your email address from bots that will scan your website for email addresses and add it to spam lists. This is new practice we’re starting for clients because it holds a lot of potential and doesn’t cost anything to set up. It basically amounts to setting up a cookie on your website that tracks who has viewed it. You can then set up advertising campaigns to reach this audience. You’ve probably seen it happen to you while visiting Amazon. You explore some products like table saw and then you see ads for table saws on all the websites you visit. This is more focused advertising than general pay per click and thus it nets better results. You may never click on that ad, but it reminds you that you still need to buy a table saw. With respect to restaurants it’s a great way to stay top of mind, promote changes like a new Sunday brunch, and just build a growing online presence. Google has the option in Google Adwords. You may not be ready to do any online advertising at this stage. But if you set up a retargeting pixel in the beginning, you will have a larger audience built up when you are ready to advertise. 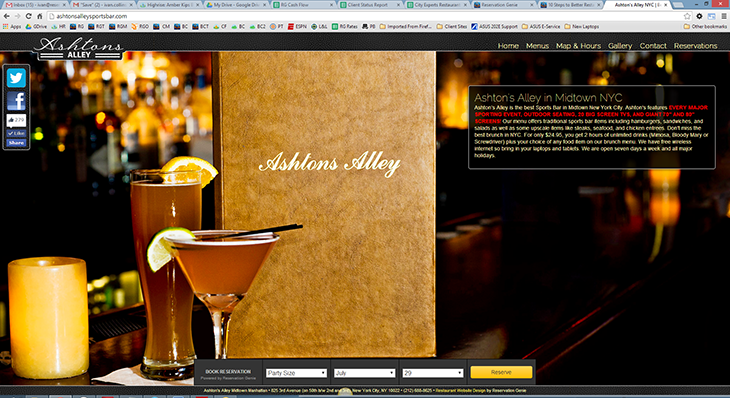 Well we hope that helps you make some decisions about your restaurant website design project. Feel free to reach out to us about how to implement any of these ideas. And if you need a reliable website designer, we’ll be happy to help. 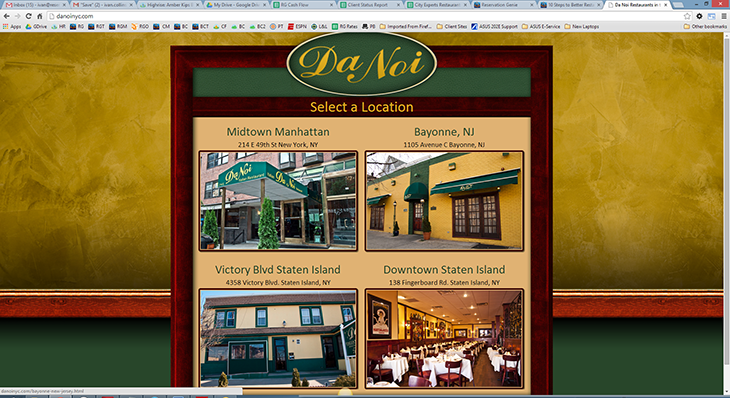 Below are screen shots to some of our projects that you can click on to visit their site.